As the United Nations opens its 68th General Assembly session, publics around the world continue to have a positive impression of the international organization. Clear majorities in 22 of the 39 countries surveyed say they have a favorable view of the UN, including thumbs-up from Security Council permanent members Britain, France and the U.S. Ratings for the UN are on balance favorable in Russia. But the Chinese are divided in their opinion. However, views trend negatively in key Middle Eastern publics, including Israel, the Palestinian territories, Jordan and Turkey. Overall, a median of 58% across the 39 countries surveyed express favorable views of the UN, with just 27% holding an unfavorable opinion. South Koreans express the highest support (84%). Ban Ki-moon, who heads the UN, is South Korean. Meanwhile, roughly eight-in-ten Indonesians and Filipinos approve of the international body. Support is also high in Africa, and most of Europe and Latin America. 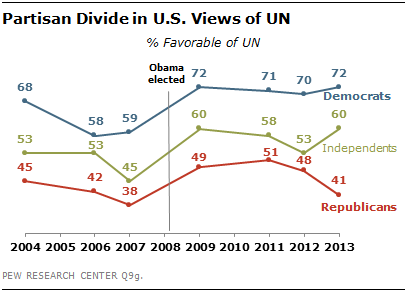 Nearly six-in-ten Americans have a favorable opinion of the UN, headquartered in New York City, and support is up since the 2008 election of Barack Obama. However, there is a partisan divide in views of the multilateral institution, with stronger support from Democrats and independents than from Republicans. The survey, conducted before Syria’s alleged chemical weapons attack and the proposed UN role in eliminating Syria’s chemical weapons stockpiles1, was conducted by the Pew Research Center in 39 countries among 37,653 respondents from March 2 to May 1, 2013. Overall, majorities or pluralities in 26 of the 39 nations surveyed express a favorable opinion of the UN. And in only five nations does a majority of the public hold a negative view of the institution. Roughly six-in-ten Canadians (62%) and Americans (58%) hold a positive opinion toward the UN. And support is up among Americans since 2007 (+10 percentage points), with the largest increase coming in 2009. The UN is generally liked in Europe, with six-in-ten or more in Italy, Germany, Britain, Poland, France and the Czech Republic expressing positive sentiments. However, in Spain, only half share these opinions and support has fallen 13 percentage points since 2007. In Greece, 58% have an unfavorable view of the international body. In Russia, one of the five permanent members of the Security Council, 53% support the UN, while only 28% have an unfavorable view. UN support is lowest in the Middle East. Majorities in Israel (70%), the Palestinian territories (69%), Jordan (61%) and Turkey (56%) all give the UN negative marks. Three-quarters of Israeli Jews have an unfavorable opinion of the UN. Meanwhile, Israeli Arabs have a more positive view of the UN (53% favorable vs. 43% unfavorable). Among all Israelis, favorable ratings for the UN are down 11 points since 2007. In the Palestinian territories, equal numbers in the West Bank (67%) and Gaza Strip (69%) have an unfavorable view of the international body. The UN receives its highest ratings from publics in the Asia-Pacific, with more than eight-in-ten in South Korea (84%), Indonesia (82%) and the Philippines (82%) looking favorably toward the international body. Majorities in Australia (63%) and Malaysia (60%) also see the UN in a positive light. However, opinion is more divided in the region’s top two economic powers – only 45% in Japan and 39% in China see the UN favorably. In China, which is also a Security Council member, support for the international body has fallen 13 percentage points since 2007. In Pakistan, a majority (61%) have no opinion. Views of the UN are generally positive in Latin America, with majorities in Brazil (61%), El Salvador (60%) and Chile (56%) sharing a favorable view of the preeminent assembly of nations. Support for the UN is lower in the other Latin American countries surveyed, but pluralities in Mexico and Venezuela still indicate a positive assessment. Half or more in every sub-Saharan African country surveyed have a favorable view of the UN. Roughly three-quarters in Kenya (76%) and Ghana (73%) view the UN favorably, but support is down 12 percentage points in each country since 2007. Around seven-in-ten Senegalese (70%) and Nigerians (69%) like the UN, but the organization is more popular among Nigerian Christians (81% favorable) than Nigerian Muslims (58%). Only about half in South Africa (51%) support the UN. While overall evaluations of the UN are high, there is even greater support among the younger generation, those with a college degree, and respondents with higher incomes. For example, 73% of Americans ages 18-to-29 years old have a positive opinion of the UN, while only about half (49%) of those ages 50 and over agree, a 24-point age gap. Large generational differences also abound in Canada, Turkey, Senegal, France, Australia, Lebanon, Mexico and Spain. Overall, there are significant age gaps in 18 of the 39 countries surveyed. A similar pattern is seen when looking at educational attainment. For example, while only 21% of Turks with no college degree have a favorable opinion of the UN, 45% of those Turks with a college degree see the UN positively. In 12 countries, respondents with a college education are more likely than those without a college degree to have a favorable view of the UN. There are also gaps between high income and low income respondents on UN favorability in 12 countries. Gaps are especially large in developing economies such as Kenya (28 percentage point gap between high income and low income respondents), Bolivia (+21), El Salvador (+18), and Uganda (+18). While 58% of Americans have a positive opinion of the UN, support varies considerably by political party. 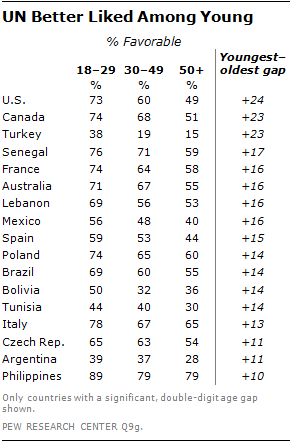 A strong majority of Democrats (72%) in the U.S. have a favorable view of the international body, while a smaller 60%-majority of independents agree. Meanwhile, support among Republicans trails at 41% and has dropped ten percentage points since 2011. In a few European countries, it is the political right more than the left that sees the UN most favorably. For example, two-thirds of French respondents on the right end of the spectrum have a positive opinion of the UN while only 56% on the left share the same view. Similar gaps occur in Spain (+11 right-left gap) and Greece (+12).